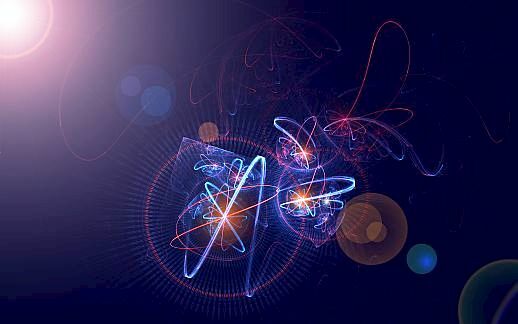 Modern scientists believe that the photon (light) is the transmitter particle (gauge boson) for electromagnetic force. Srimad Bhagavatam or Bhagavata Purana written around 3100 BCE, describes vedic atoms or hexatoms (made from combinations of 6 atoms), which are visible to naked eye under sunlight. These photons have no mass and no electric charge. They can be redirected by gravity (not because gravity attracts the photon, but because gravity bends the very space through which the photon flies). They also behave in two ways : waves and particles. Besides photons, there are a few other gauge bosons, for fundamental forces of nature. W and Z bosons (which supposedly cause the weak atomic interaction), gluons (which supposedly cause the strong atomic interaction) and the (totally speculative) gravitons (which are expected to cause gravitional force although no one has ever detected a graviton). Physicists are trying hard to figure out how these particles fit together in a grand unification theory. They believe that if this is figured out, then everything about the elegant universe will be understood without any need for primitive gods, deities and other “unscientific” stuff. But, Bhavatam composed by Sage Veda Vyas 5100 years ago has mentioned about these gauge bosons (Hexatoms and Photons), which was not understood by modern science until last century. Sage Maitreya speaking to Vidura, says that the photon is actually made up of 6 (specifically 3 groups of 2) atomic particles. Translation : Division of gross time is calculated as follows: Two atoms make one double atom, three double atoms make one Hexatom. This Hexatom is visible in the sun light which enters through the holes of a window screen. One can clearly see that the Hexatom goes up towards the sky. Here trasareṇuḥ is Hexatom or Photon.